The Restore Pennsylvania initiative would generate $4.5 million for improvements to the commonwealth's infrastructure. Gov. 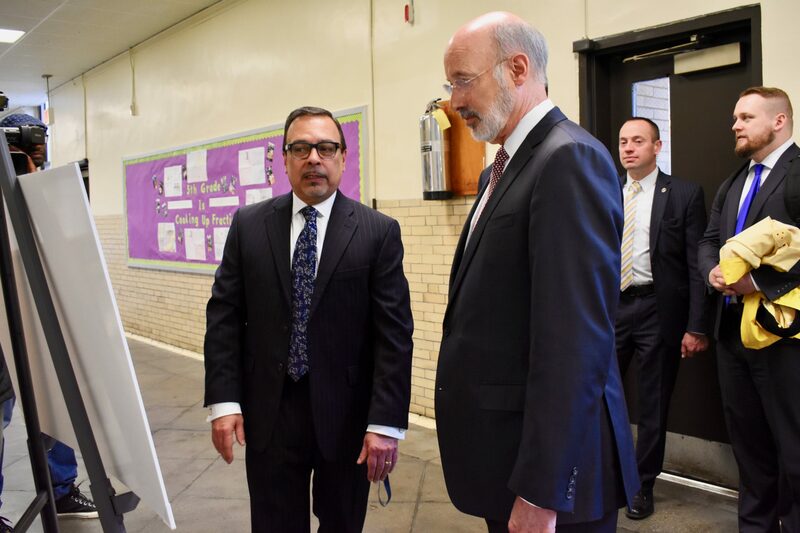 Tom Wolf visited John H. Taggart School in Whitman this week to discuss how funds from his Restore Pennsylvania initiative could help to remediate contaminants in decaying schools throughout the state. Over the next four years, the massive proposal, which the governor announced in late January, would generate $4.5 billion through the monetization of a “commonsense severance tax” with funds designated for various infrastructure projects, including storm preparedness, disaster recovery, downstream manufacturing, business development, energy infrastructure and high speed internet access. The potential tax would generate roughly $300 million a year in taxes, which will pay off the more than $4 billion in bonds over the next 20 years. Although up to 40 schools, including Taggart, will continue to receive last year’s more than $15 million in combined state grants and district funding to address toxic issues, Wolf estimates that an additional $100 million would be needed to remove lead and other contaminants in 200 of Philadelphia’s public schools. Pennsylvania is currently the only oil-producing state in the nation without a severance tax, which is a state-imposed fee on the extraction of non-renewable natural resources. Wolf says Pennsylvania, which is the second-leading producer of natural gas in the country, continues to lose out on necessary funds without a severance tax. State Sen. Larry Farnese noted that Pennsylvania is located on one of the largest natural gas reserves in the world – the Marcellus Shale. “Now it is time, well past time, for all stakeholders to come together for a program that’s going to not only make Pennsylvania better, but most importantly, it’s going to make the success, possibilities and the opportunities that we’re going to be giving our kids throughout Pennsylvania,” Farnese said. Hite, who explained the difficulties of renovating aging schools, says according to a facility analysis from a few years ago, just to restore all of the district’s buildings to code would cost $4.5 billion. With 46 schools identified as “high-need” for lead-remediation, 30 of which should be completed by the end of the summer through last year’s $15.6 million funding, Hite stresses this step is not nearly enough. The 103-year-old building of Taggart, which has undergone renovations throughout the past year, is one of dozens of schools that has been funded through the $15 million boost. Improvements included lead paint remediation and modernization of classrooms, including fifth-grade teacher Meredith Avicolli’s room. 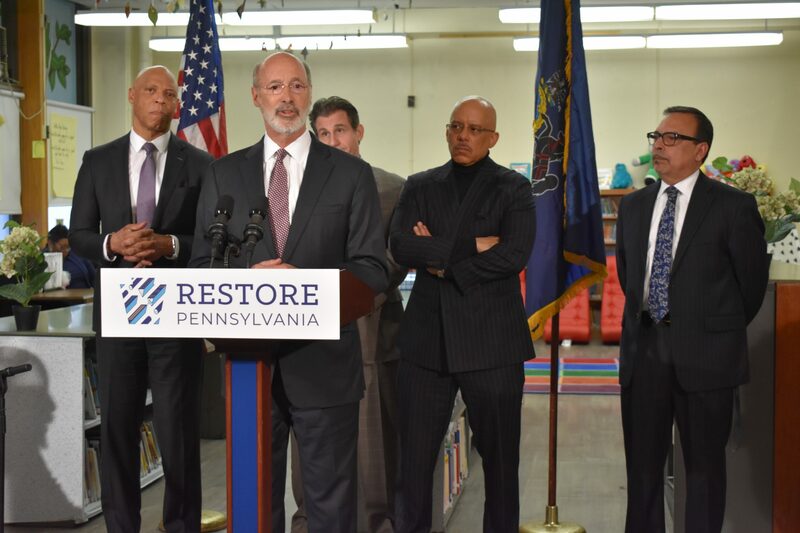 Wolf notes that Restore Pennsylvania is separate from the state budget. After introducing the plan in February, Wolf says it’s now a matter of the state legislature voting on the proposal in the upcoming weeks. Seeking a bipartisan and bilateral process, Wolf says he’s looking to the state legislature to assist in designing the details of this process.